WHEN DOES THE SPIRIT LEAVE THE BODY DEFINITELY? Ruanel: No, it was not rotten, because otherwise he wouldn’t be able to be resurrected. Interlocutor: Now, from the spiritual point of view, which is the irreversible death, that is to say, the death doesn't admit any kind of resurrection? Ruanel: The death where there is no return is the brain death. Interlocutor: Is that pure fiction? Ruanel: No, no, it is correct. The patient can be declared dead but they can revive him with electric shocks, as long as the brain is still alive, otherwise it is not possible. Interlocutor: In which moment Lazarus could not be resuscitated not even by the Absolute? Ruanel: From the moment in which his brain was destroyed... At some point you mentioned cryonics. Ruanel: Well. In cryonics, although the body is apparently dead, as long as the brain stays intact, with its neurons frozen but without any deterioration, if in the future there is a technique of reanimation - that will be - the same 10% can embody again, because that 10% has memories of the last life, it fits, as if they were pieces of a puzzle, with the neurons that are also deposits of memory in the physical plane. Interlocutor: Couldn’t it be taken by other spirit? Ruanel: No, because the other spirit would not have the same memory. Then, as long as that matter continues alive, the only spirit that can take it is the original. Interlocutor: Is that what happened to Jesus and Lazarus? I mean to the fact that their brains were intact and for that reason they could be resurrected. Ruanel: In the case of Lazarus, the time he was "dead" was brief and for that reason Jesus could resuscitate him. Interlocutor: I believe I have read in some part that Lazarus was already rotten. Ruanel: Rule that out completely. It is totally absurd. There is nobody who can change the laws of the physical plane. Interlocutor: Not even the Absolute? Ruanel: Not even the Absolute, because that would be against his own laws. If he made it, he would be contradicting himself and that would be preposterous. Interlocutor: And in the case of Jesus? Ruanel: In the case of Jesus, it passed more time. Interlocutor: But the brain was intact when they resurrected him? Ruanel: At this time Johnakan is dictating me. And it is a scoop. Jesus’s brain was conserved during more time because the Master had already been in contact with the extraterrestrials - where the Bible calls the Transfiguration - and when being radioactive there was a genetic change in his body that allowed him to last many hours intact. Interlocutor: Was that same radiation applied to him later on in order to resuscitate him? Ruanel: Correct. What I say is important to complete what you already have written on the Master's resurrection. Interlocutor: Saving the distances, of course, our doctors also resuscitate. Ruanel: Sure, but saying that the doctors resuscitate is not completely correct, because it is about an apparent death. Interlocutor: Then the aliens didn’t resurrect him either. Ruanel: Actually no, because it is, as I said an apparent death. 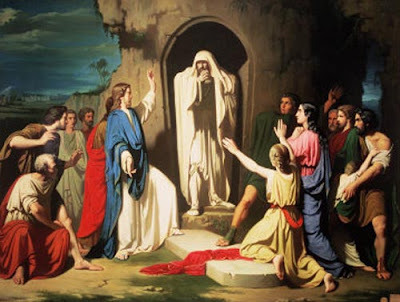 Interlocutor: Then Jesus and Lazarus resurrections are apparent resurrections? Ruanel: From a certain point of view that is correct. In fact, they were true resurrections, if we keep in mind that on Earth this cannot be done because there are no techniques to resurrect a person. Notice that at the hospitals, in much smaller cases, in the second electric shock when the heart doesn't react the doctors say: "Well, he’s gone already”, to use a very common sentence of the physical plane. But with superior techniques, where they replace the electric shocks by radioactive shocks, the heart can be revived perfectly as long as the brain and its neurons are, in a higher percentage, under good conditions. Interlocutor: Summarizing, then, the resurrection is impossible when the brain is already destroyed. Interlocutor: Couldn’t be repaired a destroyed brain at all? Ruanel: No, because there are neuronal areas that are deposits of memories. That is "virtual." And although there were techniques to repair those tissues, how do you insert those memories again? Interlocutor: Would the person become a zombie? Ruanel: He could be as a brainless, applying a term or yours. Notice that in an opportunity you were debating with this vessel sustaining that the brain was a machine. Interlocutor: Yes, it was a while ago. Ruanel: Well, now I prove it to you, because as well as the 10%, stores all the memories of the last life, when the 10% disincarnates, the other 90% incorporates those memories to all the memories of previous lives, which means that matter also stores memory while it lives. And the proof of this is in that if you could make a brain transplant to a human being, the spirit would not be with that body but rather it would go with the brain, because the spirit stays in the memory. I translate it better: Subject “A”-brain “A”, subject “B”-brain “B”, 10% “A”- 10% “B” (we are speak of the 10% spirit). Well, if the subject “A” receives the brain “B” and the subject “B” receives the brain of the subject “A”, the 10% of the subject “A” will be with the subject “B”, but with the brain “A” because the spirit will always go with the brain. And the 10% of “B” will be with the subject “A” but with the brain “B”, for the same reason, because the spirit will always go with the brain, not with the body. If the brain were a machine, the 10% would not need to follow it. Interlocutor: I understand. And where would the 10% lodge in the other subject? Maybe now in the brain? Ruanel: We have already said that the 10% of the incarnated spirit lodges virtually in the cardiac chakra. For that reason when we are incarnated, when we say the word “I” instinctively we touch this chakra. In the cardiac chakra, then, the nucleus of the 10% is housed in fact it is not the nucleus, because there is no nucleus, but I call it in that way to be understood. In the event of a hypothetical brain transplant, the 10% would lodge in the cardiac chakra of the other body. Interlocutor: Could we make some day a brain transplant or it is directly impossible? Ruanel: The brain transplant, in fact, is a total utopia because each brain "controls" the body in a certain way, for example your hands, your ailments, your tics, and if suddenly the brain of this vessel were transplanted to your body and your brain were transplanted to this vessel, none of them would fit, because the encephalic masses are not equal, and secondly because the neural networks and the tissues would not fit either. It’s not something like the chips of a TV that are exchangeable. Besides, when you were a baby you learned how to move your fingers because your brain fitted with your nerve endings. Ruanel: This demonstrates that being incarnated the spirit, the organism is not a machine but rather it has life. For example, every seven years the cells are regenerated. The brain is also a warehouse of memory. Interlocutor: Summarizing, the brain is interrelated with the whole physical organism and therefore a transplanted brain could not fit in other organism. This is clear, but then how is possible a heart transplantation? Ruanel: Because the heart is a muscle. Interlocutor: I understand. Was ever made the experiment of brain transplantation here on Earth? Ruanel: Yes, during the Nazi Germany, but they didn’t achieve absolutely nothing. Don’t even mention it. Eon: Yes, there was a request, and given the circumstances the Christic Energy felt that it was already given my implicit permission. What happens is that it was within probabilities that he remains in the physical plane. There is flexibility, but it’s important, in general, to let things run their own course. When there is any alteration is because, basically, there is a possibility of evaluation and, therefore, modification. But everything is within free will, like for example, avoiding an accident, saving a life at medical level, or correcting certain disease so that a patient heals. They are not violating the rules in the sense that you may think, in which free will is cut when healing a person by preventing him to disincarnate. Simply, there were alternatives and one of them was chosen.